Leading both the Bradenton Herald and Bradenton.com today is Carl Mario Nudi's feature on Manatee County's Haitian community. The assignment was challenging because Haitians live throughout our county, not in any one concentrated neighborhood; and Haitians aren't recognized yet as a singular ethnic group by the U.S. Census. But Carl soon found the heart of the Haitian community: church. 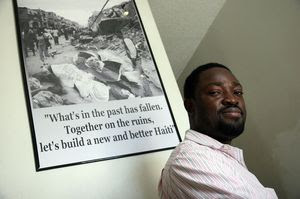 He talks with Mesack Dieudonne, who heads Let Us Take a Stand for God Ministry, a Manatee organization that links 12 area churches with Haitian congregations; the Rev. Jean Claude Presendieu, pastor of Bethesda Haitian Evangelical Church; and many others. Regardless of whether the Haitian population is 2,000 or 20,000 here, their faith is a core anchor in our community. The outpouring of help continues to show the compassionate core of our diverse community. While most communications -- press releases, letters to the editor, criticisms, news alerts, et al -- come to us paperless today, we still get a lot of traditional snail mail here at the Bradenton Herald. And while the critiques and requests far outweigh the "thank-you" cards, a bright note occasionally makes our day. I received such a letter this week, and it's one that is full of hope and promise. Jordan Sanders, high school winner of the MLK essay contest, took the time to say "thank you." And it made me wonder: When was the last time I wrote someone a "thank you" for lending a hand, for being there when I needed, for believing in me? Jordan, thank you for bringing a smile to our day. Some of the commenters on Bradenton.com hit a new low today, and we disabled the commenting on the related stories for the first time. Tragedy struck the McCarthy family yesterday, with the death of Dr. Owen McCarthy. They are well-known in this community, and have contributed much over the years. His prominence led us to assign columnist Vin Mannix to write a feature obituary, paying heed to Dr. McCarthy and his service to the community. But there was a disgusting lack of respect among the comments – so inappropriate and hateful, especially on an obituary. The only good thing that came from this: Many of our readers e-mailed or called me, asking that we remove the comments. Thank you for helping police the website. We rely on you for this, and are reassured that you care enough to flag the offending remarks. We also have provided a Legacy link for those of you with thoughtful notes to the family. As reported in the Herald today, a team of local doctors has arrived in the Dominican Republic, heading toward Haiti to help. They are led by Dr. Joseph Pecoraro, a Bradenton general surgeon and co-founder of Hearts Afire, a medical missionary organization. “We expect to do mostly amputations, treat traumatized wounds, deal with multiple fractures — we’ll do what we can,” he told me last night. Joining him are anesthesiologists Trey Bernard, Tom Nutter and orthopedic surgeon Dr. David Sugar, all from Sarasota. They are carrying supplies donated by our local hospitals, knowing it will only make a small dent. Dr. Pecoraro left an update this morning, calling from the missionaries' phone in Santo Domingo. The going sounds rough, even before they have reached any earthquake victims. The missionaries' van lost a wheel, so the doctors have found one to rent. They are still heading toward Haiti, but may be needed long before they reach the makeshift hospital. "The need is so great all the way along the Dominican border, we may or may not be able to get into Haiti," he said in a voice mail. "They're transporting patients out to the borders -- word is that the hospitals are full." So many volunteers are heading to Haiti. Pecoraro's group met up with a missions outfitter from Gainesville today, which worked out well for them. "He will be assessing from an engineering standpoint, we're assessing from a medical standpoint," Pecoraro said. He plans to keep us updated, as he is able. The enormity of the catastrophe in Haiti has dominated news coverage in the past week, as captured here at Bradenton.com/Haiti, and the outpouring of donations and volunteers is almost overwhelming. The Bradenton Herald newsroom continues to compile a vetted list on how you can help -- and linking you to the countless stories of desperate searching and, sometimes, a miracle. The tragedy is also pointing to the need to work together, as East Manatee Editor Jim Jones captured in his story today on clergy's sermons this morning across Manatee County. As so many have noted: Wouldn't the world be wonderful if that spirit existed without tragedy. That theme was also prevalent in our local students' essays on Martin Luther King Jr. this year. As I noted in my column today, almost every student cast their insights and challenges around the shooting deaths of two classmates, Dejuan Williams and Jasmine Thompson. The prayers at the MLK dinner Friday night, in church this morning, from rescue crews coming from throughout the world, all have one idealistic core: that some good comes from this cataclysmic tragedy, both in Haiti and here at home. I had a surprise waiting for me in the Herald's parking lot last night: a coyote. Angry readers are one thing, but a hungry, unfrightened wild thing -- I called for help. Jim Jones was the late-night editor, and he came out loaded with camera. That apparently was the needed weapon, as the critter went loping out of range -- and out of my harm's way. Every day's an adventure, right? Where were most folks this weekend throughout Manatee County? Inside, if they could be. The cold continues, and we seem to be talking of little else. Well, think about this as you read your Sunday newspaper or browse through Bradenton.com: The Herald newsroom has no central heat. Yep, they built the Herald as a true Florida building back in the '80s. The land of sunshine and beaches, right? And thermometers strategically placed throughout the newsroom registered in the mid- 50s last night. Inside. Brrrr, indeed. So most headlines and layouts were done with gloved fingers, chattering teeth and capped ears. Let's raise a steamy cup of hot chocolate to the Herald's late-night crew. There's no snow on the ground, you can't really see your breath in the chilly air, and mittens remain overkill. After spending a week up North where those statements are heresy, I didn't think our cold snap here in Florida would make much in headlines. But Ol' Man Winter has his grip on us, as Richard Dymond updates in today's story. And the Associated Press reminds us in this story that Florida farmers are working to salvage millions of dollars' worth of crops -- to say nothing of the sun-seeking tourists who are wondering if they packed the chilly temperatures with them. Still, this AP video starts in Wisconsin, where cold means cold -- double-digit temperatures out of the teens would be a heat wave. You can get the latest local weather at Bradenton.com/weather. Guess what? A quick glance at 8 a.m. today registered the temp at 32 -- cold enough to snow right here in Manatee County! I wish I could have brought that back in my suitcase, if only for a day!